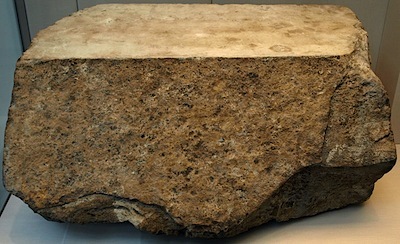 The time period during which concrete was first invented depends on how one interprets the term “concrete.” Ancient materials were crude cements made by crushing and burning gypsum or limestone. Lime also refers to crushed, burned limestone. When sand and water were added to these cements, they became mortar, which was a plaster-like material used to adhere stones to each other. Over thousands of years, these materials were improved upon, combined with other materials and, ultimately, morphed into modern concrete. Today’s concrete is made using Portland cement, coarse and fine aggregates of stone and sand, and water. Admixtures are chemicals added to the concrete mix to control its setting properties and are used primarily when placing concrete during environmental extremes, such as high or low temperatures, windy conditions, etc. The precursor to concrete was invented in about 1300 BC when Middle Eastern builders found that when they coated the outsides of their pounded-clay fortresses and home walls with a thin, damp coating of burned limestone, it reacted chemically with gases in the air to form a hard, protective surface. This wasn’t concrete, but it was the beginning of the development of cement. Early cementitious composite materials typically included mortar-crushed, burned limestone, sand and water, which was used for building with stone, as opposed to casting the material in a mould, which is essentially how modern concrete is used, with the mould being the concrete forms. As one of the key constituents of modern concrete, cement has been around for a long time. About 12 million years ago in what is now Israel, natural deposits were formed by reactions between limestone and oil shale that were produced by spontaneous combustion. However, cement is not concrete. Concrete is a composite building material and the ingredients, of which cement is just one, have changed over time and are changing even now. The performance characteristics can change according to the different forces that the concrete will need to resist. These forces may be gradual or intense, they may come from above (gravity), below (soil heaving), the sides (lateral loads), or they might take the form of erosion, abrasion or chemical attack. The ingredients of concrete and their proportions are called the design mix. The first concrete-like structures were built by the Nabataea traders or Bedouins who occupied and controlled a series of oases and developed a small empire in the regions of southern Syria and northern Jordan in around 6500 BC. They later discovered the advantages of hydraulic lime — that is, cement that hardens underwater — and by 700 BC, they were building kilns to supply mortar for the construction of rubble-wall houses, concrete floors, and underground waterproof cisterns. The cisterns were kept secret and were one of the reasons the Nabataea were able to thrive in the desert. In making concrete, the Nabataea understood the need to keep the mix as dry or low-slump as possible, as excess water introduces voids and weaknesses into the concrete. Their building practices included tamping the freshly placed concrete with special tools. The tamping process produced more gel, which is the bonding material produced by the chemical reactions that take place during hydration which bond the particulates and aggregate together. Like the Romans had 500 years later, the Nabataea had a locally available material that could be used to make their cement waterproof. Within their territory were major surface deposits of fine silica sand. Groundwater seeping through silica can transform it into a pozzolan material, which is a sandy volcanic ash. To make cement, the Nabataea located the deposits and scooped up this material and combined it with lime, then heated it in the same kilns they used to make their pottery, since the target temperatures lay within the same range. By about 5600 BC along the Danube River in the area of the former country of Yugoslavia, homes were built using a type of concrete for floors. Around 3000 BC, the ancient Egyptians used mud mixed with straw to form bricks. Mud with straw is more similar to adobe than concrete. However, they also used gypsum and lime mortars in building the pyramids, although most of us think of mortar and concrete as two different materials. The Great Pyramid at Giza required about 500,000 tons of mortar, which was used as a bedding material for the casing stones that formed the visible surface of the finished pyramid. This allowed stonemasons to carve and set casing stones with joints open no wider than 1/50-inch. About this same time, the northern Chinese used a form of cement in boat-building and in building the Great Wall. Spectrometer testing has confirmed that a key ingredient in the mortar used in the Great Wall and other ancient Chinese structures was glutenous, sticky rice. Some of these structures have withstood the test of time and have resisted even modern efforts at demolition. By 600 BC, the Greeks had discovered a natural pozzolan material that developed hydraulic properties when mixed with lime, but the Greeks were nowhere near as prolific in building with concrete as the Romans. By 200 BC, the Romans were building very successfully using concrete, but it wasn’t like the concrete we use today. It was not a plastic, flowing material poured into forms, but more like cemented rubble. The Romans built most of their structures by stacking stones of different sizes and hand-filling the spaces between the stones with mortar. Above ground, walls were clad both inside and out with clay bricks that also served as forms for the concrete. The brick had little or no structural value and their use was mainly cosmetic. Before this time, and in most places at that time (including 95% of Rome), the mortars commonly used were a simple limestone cement that hardened slowly from reacting with airborne carbon dioxide. True chemical hydration did not take place. These mortars were weak. For the Romans’ grander and more artful structures, as well as their land-based infrastructure requiring more durability, they made cement from a naturally reactive volcanic sand called harena fossicia. For marine structures and those exposed to fresh water, such as bridges, docks, storm drains and aqueducts, they used a volcanic sand called pozzuolana. These two materials probably represent the first large-scale use of a truly cementicious binding agent. Pozzuolana and harena fossicia react chemically with lime and water to hydrate and solidify into a rock-like mass that can be used underwater. 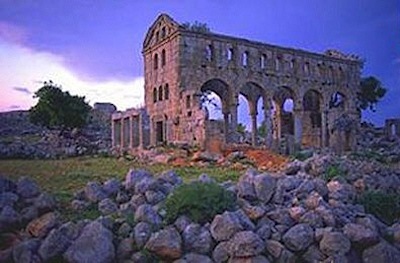 The Romans also used these materials to build large structures, such as the Roman Baths, the Pantheon, and the Colosseum, and these structures still stand today. As admixtures, they used animal fat, milk and blood — materials that reflect very rudimentary methods. On the other hand, in addition to using natural pozzolans, the Romans learned to manufacture two types of artificial pozzolans — calcined kaolinitic clay and calcined volcanic stones — which, along with the Romans’ spectacular building accomplishments, are evidence of a high level of technical sophistication for that time. Built by Rome’s Emperor Hadrian and completed in 125 AD, the Pantheon has the largest un-reinforced concrete dome ever built. The dome is 142 feet in diameter and has a 27-foot hole, called an oculus, at its peak, which is 142 feet above the floor. It was built in place, probably by starting above the outside walls and building up increasingly thin layers while working toward the center. 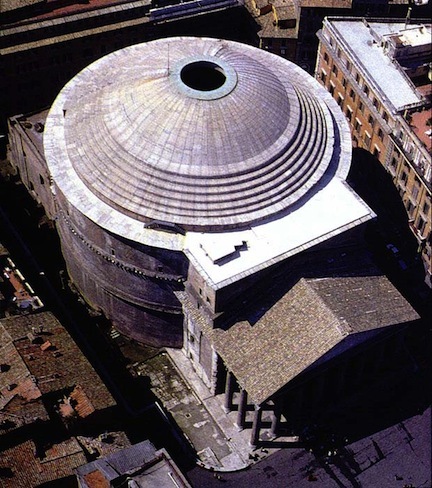 The Pantheon has exterior foundation walls that are 26 feet wide and 15 feet deep and made of pozzolana cement (lime, reactive volcanic sand and water) tamped down over a layer of dense stone aggregate. That the dome still exists is something of a fluke. Settling and movement over almost 2,000 years, along with occasional earthquakes, have created cracks that would normally have weakened the structure enough that, by now, it should have fallen. The exterior walls that support the dome contain seven evenly spaced niches with chambers between them that extend to the outside. These niches and chambers, originally designed only to minimize the weight of the structure, are thinner than the main portions of the walls and act as control joints that control crack locations. Stresses caused by movement are relieved by cracking in the niches and chambers. 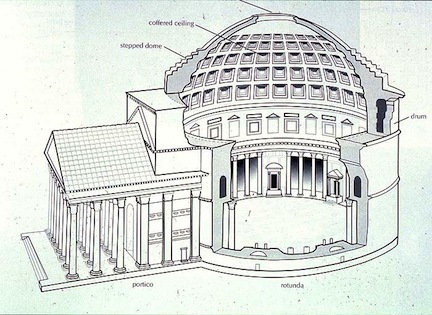 This means that the dome is essentially supported by 16 thick, structurally sound concrete pillars formed by the portions of the exterior walls between the niches and chambers. Another method to save weight was the use of very heavy aggregates low in the structure, and the use of lighter, less dense aggregates, such as pumice, high in the walls and in the dome. The walls also taper in thickness to reduce the weight higher up. Another secret to the success of the Romans was their use of trade guilds. Each trade had a guild whose members were responsible for passing their knowledge of materials, techniques and tools to apprentices and to the Roman Legions. In addition to fighting, the legions were trained to be self-sufficient, so they were also trained in construction methods and engineering. During the Middle Ages, concrete technology crept backward. After the fall of the Roman Empire in 476 AD, the techniques for making pozzolan cement were lost until the discovery in 1414 of manuscripts describing those techniques rekindled interest in building with concrete. It wasn’t until 1793 that the technology took a big leap forward when John Smeaton discovered a more modern method for producing hydraulic lime for cement. He used limestone containing clay that was fired until it turned into clinker, which was then ground it into powder. He used this material in the historic rebuilding of the Eddystone Lighthouse in Cornwall, England. 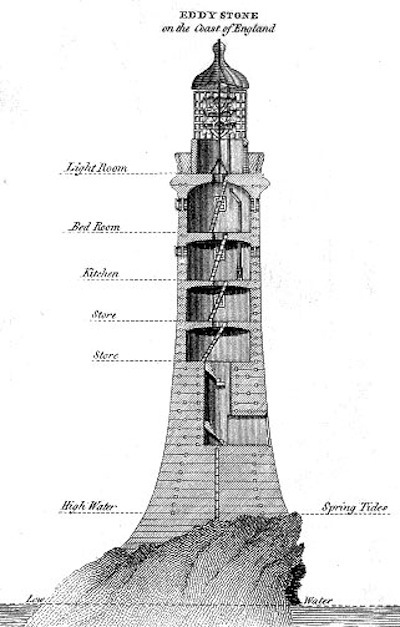 Smeaton’s version (the third ) of the Eddystone Lighthouse, completed in 1759. After 126 years, it failed due to erosion of the rock upon which it stood. Finally, in 1824, an Englishman named Joseph Aspdin invented Portland cement by burning finely ground chalk and clay in a kiln until the carbon dioxide was removed. It was named “Portland” cement because it resembled the high-quality building stones found in Portland, England. It’s widely believed that Aspdin was the first to heat alumina and silica materials to the point of vitrification, resulting in fusion. During vitrification, materials become glass-like. Aspdin refined his method by carefully proportioning limestone and clay, pulverizing them, and then burning the mixture into clinker, which was then ground into finished cement. Before Portland cement was discovered, and for some years afterward, large quantities of natural cement were used, which were produced by burning a naturally occurring mixture of lime and clay. Because the ingredients of natural cement are mixed by nature, its properties vary widely. Modern Portland cement is manufactured to detailed standards. Some of the many compounds found in it are important to the hydration process and the chemical characteristics of cement. It’s manufactured by heating a mixture of limestone and clay in a kiln to temperatures between 1,300° F and 1,500° F. Up to 30% of the mix becomes molten but the remainder stays in a solid state, undergoing chemical reactions that can be slow. Eventually, the mix forms a clinker, which is then ground into powder. A small proportion of gypsum is added to slow the rate of hydration and keep the concrete workable longer. Between 1835 and 1850, systematic tests to determine the compressive and tensile strength of cement were first performed, along with the first accurate chemical analyses. It wasn’t until about 1860 that Portland cements of modern composition were first produced. In the early days of Portland cement production, kilns were vertical and stationary. In 1885, an English engineer developed a more efficient kiln that was horizontal, slightly tilted, and could rotate. The rotary kiln provided better temperature control and did a better job of mixing materials. By 1890, rotary kilns dominated the market. In 1909, Thomas Edison received a patent for the first long kiln. This kiln, installed at the Edison Portland Cement Works in New Village, New Jersey, was 150 feet long. This was about 70 feet longer than the kilns in use at the time. Industrial kilns today may be as long as 500 feet. Although there were exceptions, during the 19th century, concrete was used mainly for industrial buildings. It was considered socially unacceptable as a building material for aesthetic reasons. The first widespread use of Portland cement in home construction was in England and France between 1850 and 1880 by Frenchman Francois Coignet, who added steel rods to prevent the exterior walls from spreading, and later used them as flexural elements. The first home built using reinforced concrete was a servant’s cottage constructed in England by William B. Wilkinson in 1854. In 1875, American mechanical engineer William Ward completed the first reinforced concrete home in the U.S. It still stands in Port Chester, New York. Ward was diligent in maintaining construction records, so a great deal is known about this home. It was built out of concrete because of his wife’s fear of fire, and in order to be more socially acceptable, it was designed to resemble masonry. This was the start of what is today a $35 billion industry that employs more than 2 million people in the U.S. alone. 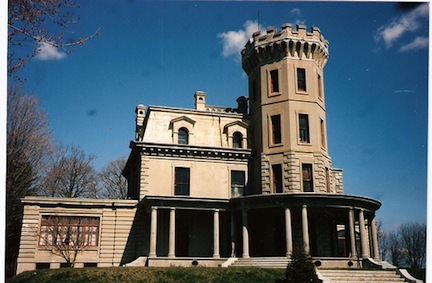 The home built by William Ward is commonly called Ward’s Castle. In 1891, George Bartholomew poured the first concrete street in the U.S., and it still exists today. The concrete used for this street tested at about 8,000 psi, which is about twice the strength of modern concrete used in residential construction. 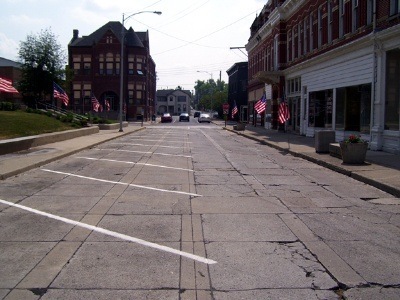 Court Street in Bellefontaine, Ohio, which is the oldest concrete street in the U.S.
By 1897, Sears Roebuck was selling 50-gallon drums of imported Portland cement for $3.40 each. Although in 1898 cement manufacturers were using more than 90 different formulas, by 1900, basic testing — if not manufacturing methods — had become standardized. During the late 19th century, the use of steel-reinforced concrete was being developed more or less simultaneously by a German, G.A. Wayss, a Frenchman, Francois Hennebique, and an American, Ernest L. Ransome. Ransome started building with steel-reinforced concrete in 1877 and patented a system that used twisted square rods to improve the bond between steel and concrete. Most of the structures he built were industrial. Hennebique started building steel-reinforced homes in France in the late 1870s. He received patents in France and Belgium for his system and was highly successful, eventually building an empire by selling franchises in large cities. He promoted his method by lecturing at conferences and developing his own company standards. As did Ransome, most of the structures Hennebique built were industrial. In 1879, Wayss bought the rights to a system patented by a Frenchman named Monier, who started out using steel to reinforce concrete flower pots and planting containers. Wayss promoted the Wayss-Monier system. 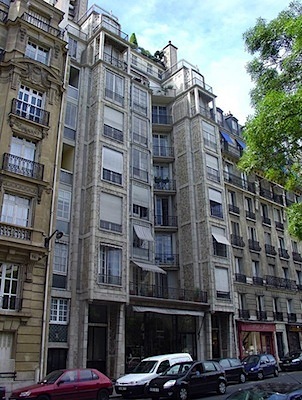 In 1902, August Perret designed and built an apartment building in Paris using steel-reinforced concrete for the columns, beams and floor slabs. The building had no bearing walls, but it did have an elegant façade, which helped make concrete more socially acceptable. The building was widely admired and concrete became more widely used as an architectural material as well as a building material. 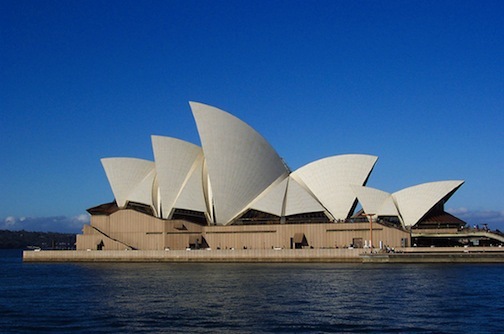 Its design was influential in the design of reinforced-concrete buildings in the years that followed. In 1904, the first concrete high-rise building was constructed in Cincinnati, Ohio. It stands 16 stories or 210 feet tall. 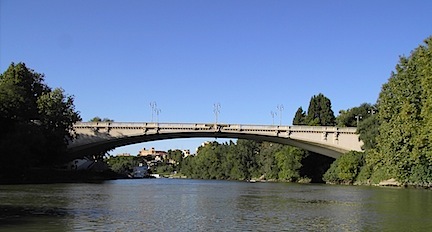 In 1911, the Risorgimento Bridge was built in Rome. It spans 328 feet. In 1913, the first load of ready-mix was delivered in Baltimore, Maryland. Four years later, the National Bureau of Standards (now the National Bureau of Standards and Technology) and the American Society for Testing and Materials (now ASTM International) established a standard formula for Portland cement. 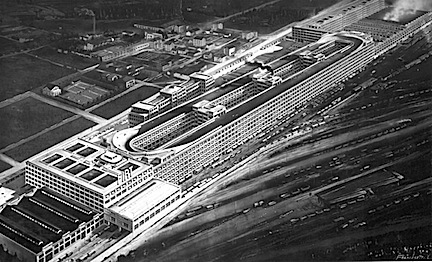 In 1915, Matte Trucco built the five-story Fiat-Lingotti Autoworks in Turin using reinforced concrete. The building had an automobile test track on the roof. Eugène Freyssinet was a French engineer and pioneer in the use of reinforced- concrete construction. 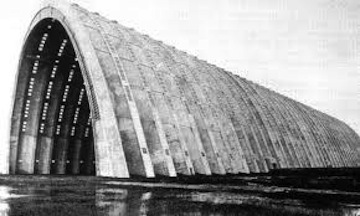 In 1921, he built two gigantic parabolic-arched airship hangars at Orly Airport in Paris. In 1928, he was granted a patent for pre-stressed concrete. In 1930, air-entraining agents were developed that greatly increased concrete’s resistance to freezing and improved its workability. Air entrainment was an important development in improving the durability of modern concrete. Air entrainment is the use of agents that, when added to concrete during mixing, create many air bubbles that are extremely small and closely spaced, and most of them remain in the hardened concrete. Concrete hardens through a chemical process called hydration. For hydration to take place, concrete must have a minimum water-to-cement ratio of 25 parts of water to 100 parts of cement. Water in excess of this ratio is surplus water and helps make the concrete more workable for placing and finishing operations. As concrete dries and hardens, surplus water will evaporate, leaving the concrete surface porous. Water from the surrounding environment, such as rain and snowmelt, can enter these pores. Freezing weather can turn this water to ice. As that happens, the water expands, creating small cracks in the concrete that will grow larger as the process is repeated, eventually resulting in surface flaking and deterioration called spalling. When concrete has been air-entrained, these tiny bubbles can compress slightly, absorbing some of the stress created by expansion as water turns to ice. Entrained air also improves workability because the bubbles act as a lubricant between aggregate and particles in the concrete. Entrapped air is composed of larger bubbles trapped in the concrete and is not considered beneficial. Expertise in building with reinforced concrete eventually allowed the development of a new way of building with concrete; the thin-shell technique involves building structures, such as roofs, with a relatively thin shell of concrete. Domes, arches and compound curves are typically built with this method, since they are naturally strong shapes. In 1930, the Spanish engineer Eduardo Torroja designed a low-rise dome for the market at Algeciras, with a 3½-inch thickness that spanned 150 feet. Steel cables were used to form a tension ring. 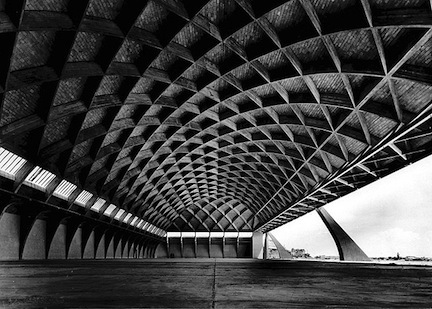 At about the same time, Italian Pier Luigi Nervi began building hangars for the Italian Air Force, shown in the photo below. The hangars were cast in place, but much of Nervi’s work used pre-cast concrete. Probably the most accomplished person when it came to building using concrete shell techniques was Felix Candela, a Spanish mathematician-engineer-architect who practiced mostly in Mexico City. The roof of the Cosmic Ray Laboratory at the University of Mexico City was built 5/8-inch thick. His trademark form was the hyperbolic paraboloid. Although the building shown in the photo below was not designed by Candela, it’s a good example of a hyperbolic paraboloid roof. 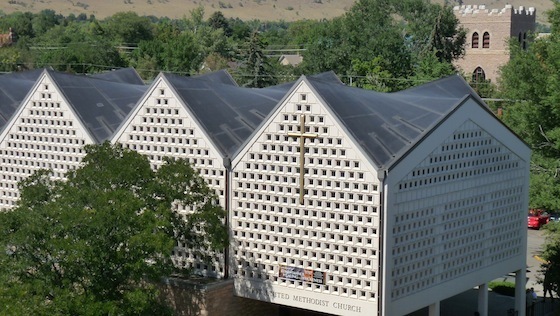 Some of the most striking roofs anywhere have been built using thin-shell technology, as depicted below. 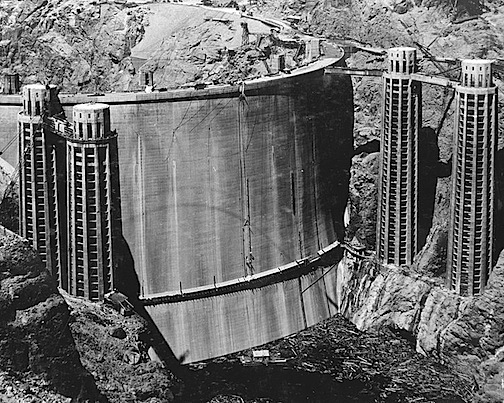 In 1935, the Hoover Dam was completed after pouring approximately 3,250,000 yards of concrete, with an additional 1,110,000 yards used in the power plant and other dam-related structures. Bear in mind that this was less than 20 years after a standard formula for cement was established. 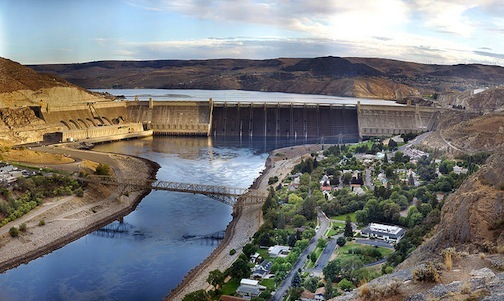 The Grand Coulee Dam in Washington, completed in 1942, is the largest concrete structure ever built. It contains 12 million yards of concrete. Excavation required the removal of over 22 million cubic yards of dirt and stone. To reduce the amount of trucking, a conveyor belt 2 miles long was constructed. 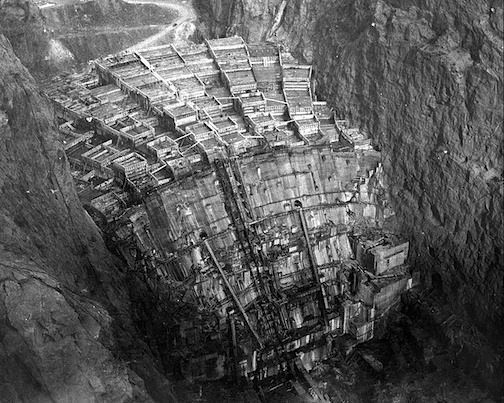 At foundation locations, grout was pumped into holes drilled 660 to 880 feet deep (in granite) in order to fill any fissures that might weaken the ground beneath the dam. To avoid excavation collapse from the weight of the overburden, 3-inch pipes were inserted into the earth through which chilled liquid from a refrigerating plant was pumped. This froze the earth, stabilizing it enough that construction could continue. 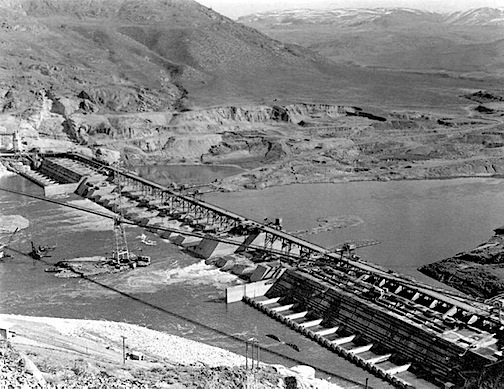 Concrete for the Grand Coulee Dam was placed using the same methods used for the Hoover Dam. After being placed in columns, cold river water was pumped through pipes embedded in the curing concrete, reducing the temperature in the forms from 105° F (41° C) to 45° F (7° C). This caused the dam to contract about 8 inches in length, and the resulting gaps were filled with grout. In the years following the construction of the Ingalls Building in 1904, most high-rise buildings were made of steel. Construction in 1962 of Bertrand Goldberg’s 60-story Twin Towers in Chicago sparked renewed interest in using reinforced concrete for high-rises. The world’s tallest structure (as of 2011) was built using reinforced concrete. 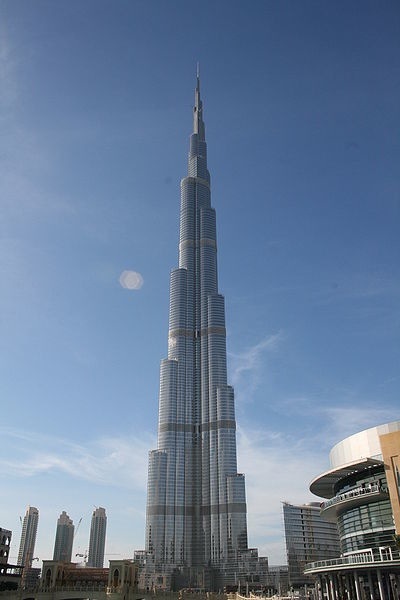 The Burj Khalifa in Dubai in the United Arab Emirates (UAE) stands 2,717 feet tall. It’s a mixed-use structure, with a hotel, office and retail space, restaurants, nightclubs, swimming pools, and 900 residences. Construction used 431,600 cubic yards of concrete and 61,000 tons of rebar. The building has an empty weight of about 500,000 tons, which is about what the mortar weighed that went into the construction of the Great Pyramid at Giza. Burj Khalifa can hold 35,000 people at a time. To cover 160 stories, some of the 57 elevators travel 40 mph. Dubai’s hot, humid climate, combined with the air conditioning needed to handle outdoor temperatures that reach over 120° F, produce so much condensation that it is collected in a holding tank in the basement and used for landscape irrigation. The Great Pyramid at Giza held the record as the world’s tallest man-made structure for about 4,000 years. A building 568 feet taller than the Burj Khalifa is scheduled for completion in 2016 in Kuwait. Nick Gromicko and Kenton Shepard. 2017. The History of Concrete. [ONLINE] Available at: https://www.nachi.org/history-of-concrete.htm. [Accessed 26 May 2017]. GP Borg Group has been entrusted to build the new school project in Kirkop. Built on 3 floors, with a built up area of 3,400 square meters and an overall area of 13,700 square meters, the project has a completion time of 42 weeks.